I love the convenience of digital console games nowadays. Not just because I rarely have to go to game stores anymore, but because the format has allowed major Japanese publishers to take greater risks on localizing niche titles that may or may not catch on. The Hatsune Miku: Project Diva series is just one of many examples – SEGA brought us Project Diva F as a digital-only release, but the success of the title prompted full-on physical releases of Project Diva F 2nd, and now, Hatsune Miku: Project Mirai DX. The diminutive digital diva has made her debut on the 3DS, but can this chibi-sized rhythm game keep time with the excellence of its predecessors? 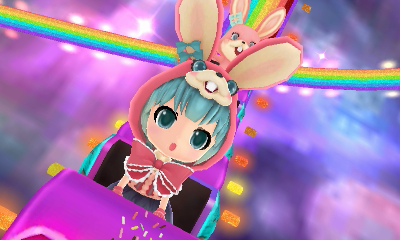 Just like the Project Diva games before it, the gameplay of Project Mirai is fairly simple. If you’ve played Theatrhythm Final Fantasy, you’ll be at home here. A circular timing indicator travels around the screen on a single track; when the indicator overlaps with a note icon, you tap the portion of the touchscreen whose color matches the icon. Other icons may ask you to swipe in a given direction, hold the stylus on the screen for a particular duration, or “spin” by rapidly drawing circles. Higher difficulties add more notes and more colors for you to keep track of. For those who want a more traditional experience, a “Button Mode” replaces the colored icons with button prompts, which makes the game play a lot like Project Diva. I enjoyed both styles quite a bit, and the game encourages you to play both rather than choose one, essentially doubling the amount of gameplay. The gameplay is simple, but that’s a good thing in the rhythm genre. Rhythm games are at their best when they’re testing your execution, rather than your ability to figure out what to do. That said, unfortunately for veterans of the genre (or even just this series), the game has a rather low difficulty ceiling. Tap Mode has very wide timing windows, making it too easy to just fudge your way through difficult tracks – even the highest-difficulty charts took me no more than two tries to get the highest rank of S+. Button Mode judges you more strictly and has trickier charts to boot, but even then, the most difficult charts in Button Mode don’t come anywhere near the craziness Project Diva would throw at you. Again, the game is a lot of fun, but if you consider yourself good at rhythm games, don’t expect a lot of pushback from Project Mirai. The soundtrack itself, as usual for this series, is a delight. It’s probably the most consistent tracklist we’ve seen from the series so far. It’s all very upbeat music with saccharine robotic vocals, but it’s extremely catchy and very melodic; I’ve woke up every morning since playing this game humming a different tune from the soundtrack. 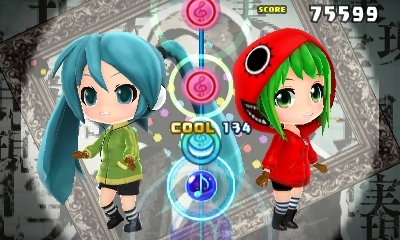 That said, it doesn’t have as many standouts as the Project Diva games did – in fact, two of the best songs in Project Mirai (“Senbonzakura” and “The World is Mine”) have already appeared in Project Diva. It wouldn’t be a Hatsune Miku game without music videos, of course, and Project Mirai is no exception. Each song has a unique video accompaniment that plays in the background while you tackle a song, showing the song’s vocalist(s) singing and dancing. In keeping with series tradition, these videos range from single-scene choreographed dances to elaborate, oddly dramatic visual narratives. 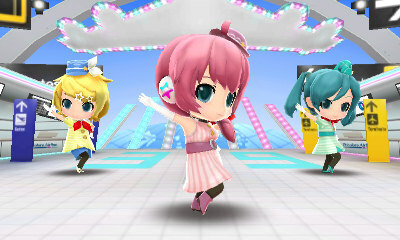 The biggest difference between this game’s videos and those from Project Diva is the character design – the characters in this installment are rendered in a super-deformed chibi style inspired by Nendoroid toys. This is reflective of the game’s visual design in general; everything from the menus to the typeface is aggressively cute, in contrast with Project Diva’s utopian future look-and-feel. 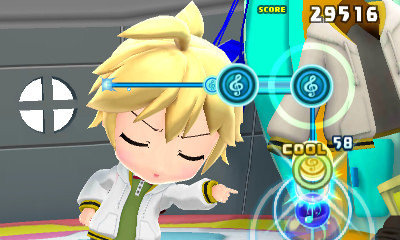 I personally prefer the less silly look of Project Diva, but Project Mirai’s visuals are by no means bad. There is a lot to do in Project Mirai. This game has a whopping 48 songs, and all of them are full-length cuts of around 3-4 minutes instead of the 90-second cuts usually used in rhythm games. Beyond the main game, you can visit “Mirai Town” and hang out with the game’s six Vocaloid characters. This takes the form of a surprisingly expansive “friendship sim,” with a number of simple activities such as clothes shopping and dance choreography. It’s a nice laid-back diversion for when you want to take a break from the rhythm game. Highlights of this mode include simple takes on the board game Reversi and the classic versus puzzle game Puyo Puyo, but it’s fun enough just to buy the characters new outfits and decorate their rooms with bizarre items. Just like the Project Diva games before it, there isn’t even an attempt at a story to justify any of this, but there honestly doesn’t need to be one. 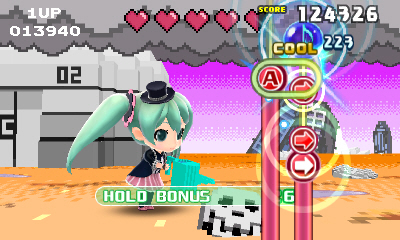 Hatsune Miku: Project Mirai DX is a good rhythm game. Everything is very solid, it’s fun the whole time, and there is a huge array of additional content to get through. The problem is that, while Project Mirai is good, Project Diva was unequivocally great. The low difficulty ceiling hurts a lot of the game’s long-term appeal, and the soundtrack, while consistent, doesn’t have the same concentration of really great tunes that the Project Diva games did. I still recommend it to fans of rhythm games and/or the general Hatsune Miku franchise, but said recommendation isn’t quite as glowing as it was for the previous games.